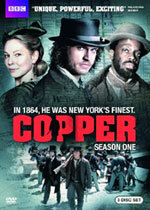 Copper: Mystery and Suspense on Television. In 1864, he was New York's finest. Tom Weston-Jones stars as Kevin Corcoran, an intense, rugged Irish-immigrant cop working the city's notorious Five Points neighborhood. Corcoran is struggling to maintain his moral compass in a turbulent world while on an emotional and relentless quest to learn the truth about the disappearance of his wife and the death of his daughter. 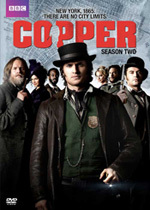 This BBC America original historical crime drama premiered in August 2012 and was canceled after its second season. Note: Media availability may change without notice. Page Author: Lance Wright. Site Publisher: Telemystery — The Omnimystery Family of Mystery Websites.